Crushing ballistics in the .357 Magnum arena! 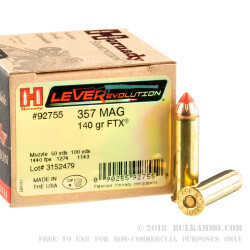 This is a stellar performer for any firearm that can chamber the 357 Magnum round. If you need a hard hitting, fast moving, and deep penetrating projectile, this is a no-nonsense hunting and defensive round that is made specifically for lever actions; but which functions just as well in revolvers. 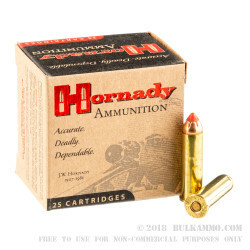 The 140 grain FTX bullet from Hornady expands uniformly, creates a ballistic profile that is virtually untouchable from normal .357 rounds – it is the absolute reality that engineering in projectile design can have dramatic impacts on performance and lethality. The quality controls at the Hornady factory and the balanced approach to the design of this “LeveRevolution” round presents a beautiful combination of hunting lethality and practical performance. It is truly an exercise in function over form – but the looks of this round are still pretty striking. 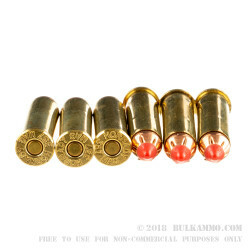 You might be intrigued by the looks or something you heard about this round, but in the end, it will be the punishing ballistic potential of the round and the absolute reliability and versatility of this .357 Magnum that will keep you coming back for more. Q: Can this be used in a revolver such as the S&W 627 VComp. 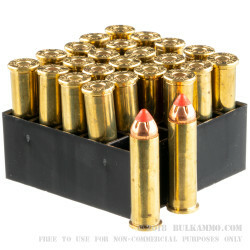 A: Hello Jeff, This ammunition will have no issues functioning in any firearm chambered for .357 Mag.